Dataran Merdeka (Independence Square) is appropriately named because it was at this place on August 30, 1957 at midnight, the Malayan flag was hoisted for the first time in the country's history upon gaining independence from the British rule. The flag raising ceremony was held at the very spot where the 100-metre high flagpole now stands. Underneath the flagpole area is Plaza Putra, an underground food, leisure and entertainment complex, as well as an underground parking bay. On the other end of the immaculately-turfed 8.2ha field lies a fountain area with elegant colonnades and colourful rows of zinnias and marigolds, a nice place to rest after a day's trip. The National Library aspires to be a world class library in the provision of excellent information services towards the realization of Malaysia's Vision of becoming an industrialized and developed nation by the year 2020 (Vision 2020) With its multifarious functions and services, supported by high-tech facilities and a well-qualified team committed to excellence, the National Library is poised to lead the nation in its pursuit of knowledge. The Kuala Lumpur Railway Station is another Moorish-style structure designed by architect A.B. Hubback. It was built in 1910, but was extensively renovated in 1986. The station is equipped with air-conditioned waiting halls, snack kiosks, money-changing booths, souvenir shops, restaurants and a tourist information counter. Across the street is the Malayan Railway Administration Building, another fine example of the British colonial adaptation of Moorish architecture. It is linked to the station by an underground thoroughfare. Before the KL Sentral Station was completed, passengers could board trains to any destination in Peninsular Malaysia as well as to Thailand and Singapore from this station. Now, only the 'Komuter' city trains stop here, and long-distance express trains have to be boarded at Sentral Station. The museum, situated at the town centre, within walking distance, at the corner of Merdeka Square, functions as an exhibition and resource centre and is housed in a 1909 building which itself was gazetted as a historical monument which forms one of the major landmark of the city of Kuala Lumpur. Thematic exhibitions are held at intervals, as do other programmes, which involve the Kuala Lumpur community. Officially opened in 1963,the House of Representatives and the Senate are located in the building. One can catch an excellent view of the Parliament House from the National Monument at the Lake Gardens. If one building truly symbolises the democratic system that Malaysia practises, it is the Parliament House, built in September 1962 near the Kuala Lumpur Lake Gardens. 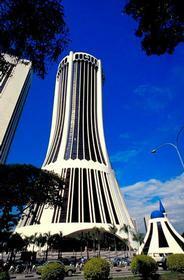 The building cost RM18mil and was the brainchild of Malaysia's first Prime Minister, Tunku Abdul Rahman. The complex consists of two parts: the main building, which is a three-storey building, and its 18-storey tower annexe. the Dewan Rakyat (Parliament) and Dewan Negara (Senate). Although the designs of the two halls are the same, the smaller Dewan Negara has nice stained glass windows with traditional Islamic motifs. Visitors are required to write a letter of application before visiting the place. There is also a dress code one must adhere to. A skyscraper, 35 storeys high, stands proudly on Jalan Hishamuddin. With high-vaulted arches decorating its entrance and its white open-fretwork glistening in the tropical sun, this is the Dayabumi Complex. As one of the city's infamous landmarks, it was the very first building in KL to boast of the Malaysian-style architecture, blending a unique combination of modern lines and Islamic motifs. The concept of this 50-acre park and garden was created by Brazillian master of gardens, Roberto Burle Marx. Being developed in stages, this oasis of greenery and water is a welcome sight for people as they leave the hi-tech buildings of Kuala Lumpur. It provides a much needed change of pace amid the constant rush in this bustling city. The combination of gardens and fountains is especially designed as a contrast to the modern structures that surround it. A beautifully designed mosque, Masjid Asy-Shakirin, adorns the park just like a jewel in the crown. Spanning over 5.44ha with a floor space of 21,000 sq/m., its RM 210 million cost should come as no surprise, looking at the distinctive facade and features the building displays.Located near the Titiwangsa Lake at the junction of Jalan Tun Razak and Jalan Kuantan, Istana Budaya was designed by a local architect, Muhammad Kamar Ya'akub. 1. "Wau Bulan" - this traditional Malay kite is used as the main motive of the theatre's floor. 2. "Sirih Junjung" - a multi-tier floral arrangement of "sirih" or betel leaves used as a symbolic piece for Malay weddings, festivities and welcoming ceremonies is reflected in the entire roof of the theatre. 3. "Rumah Melayu" - a typical Malay house pattern is the general layout of the building. It has three major sections: the lobby is the "serambi" or verandah, the auditorium represents the "rumah ibu" (living room) while the main stage and rehearsal hall is equivalent to the "rumah dapur" or kitchen. 4. "Tangga" - staircases ("tangga") that lead to the grand entrance depict the staircase of a traditional Melaka house. 5. "Tingkap" - the Royal Boxes follow the patterns of a Malay house's windows ("tingkap"), all large and spacious. 6. "Balairong Seri" - the auditorium is evidently designed similar to this royal palace hall of the olden days. In addition, Banyan Leaf, which signifies the beginning of Wayang Kulit or shadow play also decorates the theatre lobbies, and its walls are elegantly adorned by the exquisite artwork by Malaysia's National Arts Laureate, Dato Syed Ahmad Jamal. The National Art Gallery is located on Jalan Temerloh, off Jalan Tun Razak on a 5.67ha site neighboring Istana Budaya and National Library. The unique architecture of the gallery incorporates elements of traditional Malay architecture, which combined with contemporary lines has distinguished the complex as one of the most modern art venues in the region. Established on August 28, 1958 under the initiative of Tunku Abdul Rahman, the first Prime Minister of the newly independent Malaysia, the National Art Gallery started with a donation of four artworks and was housed in a borrowed space at the Dewan Tunku Abdul Rahman - Malaysia's first House of Parliament. Today, with a permanent collection of more than 2,500 pieces of artworks - the National Art Gallery is in its permanent state of the building officially launched on September 16, 2000 by the Prime Minister Datuk Seri Dr Mahathir Mohammed. Taman Tasik Perdana or fondly known as the Lake Garden, is the oldest and most popular park in Kuala Lumpur. Its main attraction is the artificial lake surrounded by lush greenery in a 92ha. (227 acres) parkland that provides a refreshing ambience. After a hard day at work, locals like to come here to take a breath of fresh air, strolling along the carefully planned paths or rowing on the lake. The park also has jogging tracks and exercise stations, as well as children's playground. Attractions in the park include a Bird Park, Butterfly Park, Deer Park and an Orchid Garden, which are all reachable either by foot or by regular shuttle buses. From the gardens, you may also visit other attractions such as the National Monument, Parliament House and the Planetarium. Only a stone's throw from the Bird Park is the colourful and beautifully landscaped Butterly Park where over 6,000 butterflies from 120 species roam and fly freely in a simulated natural rainforest environment. Here you can learn about the life cycle and mating habit of the butterflies. There is a nursery and breeding area, as well as an insect museum to enhance your knowledge about these creepy-crawlers. Comprising the beautiful landscape are flower and fruit plants and some rare herbs essential in the diet and pollinating activities of the butterflies. Situated beside the Butterfly Park, within the Lake Garden vicinity, the Orchid Garden houses about 3,000 orchid species from around the world, with 800 species from Malaysia alone. An adjoining section is devoted to the hibiscus, Malaysia's national flower. This section showcases more than 2,000 varieties of hibiscuses. It is common for the occupants of the nearby Butterfly Park to visit these gardens, creating a more lively atmosphere. The Garden is transformed into a bazaar during weekends where both the orchid and the hibiscus are on sale. Also within the Lake Gardens, this is one of the world's largest freestanding bronze sculptures. The seven soldiers atop the national monument symbolise the loyalty, sacrifice and co-operation of the people of Malaysia. Built in honour of those who had fought (and also those who fell) in World War II and the Emergency of Malaya, this monument sits on a tranquil spot, surrounded by a pool of water fountains and water lilies made of pewter. For your reading pleasure during the city tour, wish you all luck. Almost every Malaysian schoolchild would know the folk story of Hang Tuah and Hang Jebat. Hang Tuah is the most illustrious Malay hero in Melaka, leader of a closely-knit band of Melaka's finest warriors - Hang Kasturi, Hang Lekiu, Hang Lekir and Hang Jebat - a veritable Five Musketeers of Malay history. But Hang Tuah is slandered by his enemies and the Sultan unthinkingly orders him to be put to death. Fortunately for our hero, the wise Bendahara takes Hang Tuah into hiding. Hang Jebat, in anguish at the injustice done to his friend, goes in a rampage at the royal palace and the Sultan is forced to flee for his life. The Sultan laments that Hang Tuah wasa the only warrior who could ever defeat this traitor, upon which the bendahara saves the day by producing Hang Tuah before his royal person. Hang Tuah is pardoned by the repentant Sultan and despatched to kill the traitor. Hang Jebat's joy at seeing his dearest friend brought to life turns to despair when his friend lunges at him with a kris, declaring his loyalty to the Sultan and hatred for traitors. In the ensuing clash, Hang Jebat is killed, still declaring his love for a dear friend, while Hang Tuah sadly laments to his dying friend that loyalty to Sultan and duty comes before everything. This romantic version of the story, as reproduced in the Malay literary classic Hikayat Hang Tuah, has always begged the question among Malays: who was right? Hang Tuah, because he remained loyal to his Sultan and killed a traitor, even though he was his closes friend. Or Hang Jebat, who was willing to die fighting against injustice and in defence of his friend? Purely historical sources (Sejarah Melayu, Pires,et al, as opposed to the Hikayat myths and romances) attribute the rebellious behaviour to Hang Kasturi rather than Jebat. By all historical accounts, the famous final conflict was is in fact between Tuah and Kasturi. Unlike the popular folk legend, the quarrel was not over Jebat taking revenge upon the Sultan's injustice towards Tuah - Kasturi was actually just fooling around with of the Sultan's concubines and went beserk. And, by the Sejarah Melayu accounts certainly, there was little friendship exhibited in their final encounter. Historical fact aside, the Tuah-Jebat legend is interesting in that it reveals a paradox in the Malay psyche, and this paradox goes as far back as the social contract and covenant that is found in verse 56 of the Sejarah Melayu made between Sang Utama Sri Tri Buana (the Palembang ruler from whom all Malay royalty claims descent) and Demang Lebar Daun (his minister, representing the rakyat) . Demang Lebar Daun promised that "the descendants of your humble servants shall be the subjects of your majesty's throne, but they must be well-treated by your descendants. If they offend, they shall not, however grave their offence, be disgraced or reviled with evil words: if their offence is grave, let them be out to death, if that is in accordance with Muslim law". To which Sang Utama replied " I agree to give the undertaking for which you ask, but I in turn require an undertaking from you ... that your descendants shall never for the rest of time be disloyal to my descendants, oppress them and behave in an evil way to them." To which Demang Lebar Daun agreed " ... but if your descendants depart from the terms of the pact, then so will mine.. subjects shall never be disloyal or treacherous to their rulers, even iftheir rulers behave cruelly and immorally ... and if any ruler puts a single one of his subjects to shame, that shall be a sign that his kingdom shall be destroyed by Almighty God. Standards were therefore set for centuries to come. On the one hand, subjects owed absolute loyalty to the ruler - no matter how badly he behaved. On the other hand, the ruler must be the protector of the people. And if one breached the contract, the other could as well. Tuah represented that absolute loyalty - and the streak of loyalty to the ruler that ran deep in the Malay psyche. If there are three things that were important to the Malay of old, it is loyalty to ruler, religion and 'adat', and the accompanying sets of values that come with them. 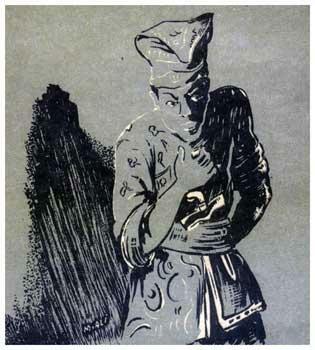 Jebat, on the other hand, represented that consequence of breaching that fragile covenant - the conflict within the Malay mind that seeks expression in that uniquely Malay word - 'amok', a rupture of the bonds that bind him. It is, of course, very appealing to think of Tuah as the ultimate champion of Malay loyalty, chivalry and obedience to tradition, and Jebat as a hero of the people fighting injustice and cruelty. Realistically thought, their actions were far from idealistic. Tuah took loyalty to the point of blind servility. According to the Hikayat Hang Tuah, even before the incident where the Sultan had ordered his execution, there was an occassion where Tuah was actually exiled by the Sultan to Inderapura. There Tuah took it upon himself to kidnap Tun Teja Menggala, the Bendahara's daughter, knowing that the Sultan lusted after her. Through bribes and deceptions, he succeeded in bringing Tun Teja to Melaka and presented her to his ruler. The Sultan was so pleased, he pardoned Tuah and promoted him to the rank of Laksmana, granting him three river districts as well. His loyalty to his Sultan evidently superseded any ethical considerations. To think of Jebat as an idealistic champion of justice is also not completely accurate. He certainly took over the mantle of Laksmana from Tuah with a great deal of relish. He dutifully read Hikayats to the Sultan. When someone lamented that Hang Tuah was needed to defend Melaka, he angrily replied "Why do you say so? Was Hang Tuah the only warrior? It looks as if he is not around ... so I will take his place." He even feels powerful enough to have amourous relationships with the Sultan's concubines, which was what finally drove the Sultan to order his death. It was not a premeditated, conscious decision by Jebat to fight injustice and avenge his friend - he had misbehaved and now had to accept death or defy the Sultan. And just as Tuah indirectly defied the Sultan by going into hiding, so did Jebat by open rebellion. Jebat going amok killing thousands of innocent people after he was wounded by Tuah certainly is no indication that he was a champion of the people. In both cases - one unconsciously, and one quite consciously - they broke the sacred covenant made centuries before between Sang Utama Sri Tri Buana and Demang Lebar Daun. The building called "Tabung Haji" (pilgrimage fund), was completed in mid eighties, the geometric product of reknowned Muslim architect Hijjas Kasturi.With a height of 152.0m, in 1984, it was not only the tallest building in Malaysia but was also hailed as the highest Muslim edifice of the world.The Tabung Haji building resembles the drum used to summon pilgrims and its five pillars represent the pillars of Islam. In line with the concept of Islam and the belief and strong determination to perform their pilgrimage, Muslims have been inspired to gather wealth to finance their journey to the Holy Land. Launched in November 1962 and commenced operation on September 30, 1963, the administration of Malaysia's hujjaj is now entirely managed by the country's Pilgrim Management and Fund Board; as a modest proposal to aid the Malayan rural economy and enable the Muslims to perform Hajj, one of the tenets of their faith. At that time, it was normal for rural Malays to save up their paddy surplus to buy buffaloes, and later to convert the buffaloes into land. The land thus bought, after years and years of saving, was later sold off for the cash to perform the pilgrimage.Royal Professor Ungku Aziz who was then an economics lecturer and who later became the Vice Chancellor of the University Malaya,realized that this use of land as savings was economically damaging.In its place, Ungku Aziz designed a simple post-office savings scheme. The intending pilgrim first has to open an account at a post office and save up by buying stamps with denominations ranging from 50 cents to RM100. It was estimated then that it would take 13 years for one to save up the needed funds of RM1,500. The rural Malays then were also known to have preferred to keep their savings 'under the mattress' rather than to trust commercial banks as they did not want to have anything to do with interest. Thus, when Tabung Haji was first launched, rural savers needed to be convinced that it would not be run like a commercial bank with interest. Instead, it was repeatedly emphasised that it would be run on the basis of investment of the savings in halal activities, and the profit gained would be deposited to the intending pilgrims' accounts as bonuses. Tabung Haji has time and again been hailed as a model for Islamic banking. Today, depositors or intending pilgrims do not need to go to to the post office to buy stamps to save up for the pilgrimage. With its branches all over Malaysia, one can deal with Tabung Haji directly. Furthermore, Tabung Haji employees are said to work on the principle of 'For Now and the Hereafter', providing service with reward from Allah in mind. One is also encouraged to start saving at a very tender age to be able to go on the pilgrimage when he or she turns an adult. Today, not only the rural Malays but Malaysian Muslims from all parts of society stand proud when they hold an account with Tabung Haji as an intending pilgrim. Indeed, with much preparation and all travelling facilities and Hajj needs taken care of, from prayer beads (tasbih) in hand to accommodation and safety, Tabung Haji pilgrims - who now include depositors from neighbouring countries, such as New Zealand, Fiji, New Caledonia, New Guinea, Australia, Korea, Japan, Hong Kong and Taiwan - find that they only have to concentrate on one thing: perfoming the Hajj. On the west coast of Peninsula Malaysia lies the hub of Malaysian life - Kuala Lumpur, the bustling business capital. The weather there is always humid. There is a short dry period during January and February when the monsoon season on the west coast has ended and the one on the east coast has begun. These dry periods also herald the infamous 'haze' caused by forest fires in nearby Indonesia, and Kuala Lumpur's own pollution. It reduces visibility dramatically and puts public officials into discussions with the Indonesian government. Over one-and-a-half million people live in this city of many races, some history and a lot of activity. The history of Kuala Lumpur means 'muddy estuary'. The Kelang and Gombak rivers that meet in the city are still the murky brown that they were in 1857, when Chinese tin prospectors discovered tin nearby. KL, as it is known to its inhabitants, then quickly became a noisy, busy town as tin was in huge demand throughout the British Empire and America. There were soon claim disputes over the tin mines and fights erupted between prospecting clans that were formed.To halt the fighting, the local Sultan elected a man called Yap Ah Loy as the leader of the Chinese community. He managed to establish order in KL and could even be considered the unofficial founding father of the city.British involvement in Malaya began a few years later after merchants encouraged the British Empire to become involved in ending the Malay Civil War as the conflict was harming their profits. KL was chosen to be the administrative centre and then the capital of Malaya. It 1974 it was designated as a federal territory. 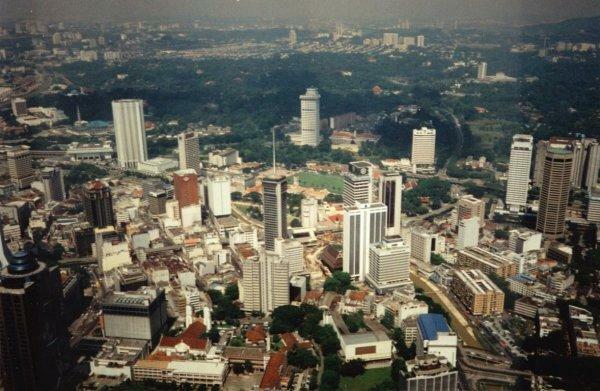 However, in 1999, the administrative capital was moved to Putrajaya. KL-ites, the people who live in Kuala Lumpur are a mixture of the three ethnic groups - Malay, Chinese and Indian. They are typical 'city' people who enjoy fast-paced life (or just put up with it). Life revolves mainly around work and eating out. Distinct cultures have become slightly blurred in the city. Do not be surprised if you hear an Indian speaking fluent Cantonese to a Chinese woman. The city has grown busier through the years and peoples' tempers have become frayed resulting in increasing road rage incidents. Food, Food, Food...;many lives in this region revolve around food. This is not surprising as the food is both delicious and varied. Among the main meeting places in the city are the roadside stalls and hawker centres. It is at these fluorescent light-lit places that many friendships are forged and many business deals brokered. Food is as varied and each of the city's cultural groups offers a little of its own to the masses. On Malay stalls you'll find satay and nasi lemak. Nasi lemak is rice cooked with coconut served with fried anchovies, fried peanuts, a boiled egg, slices of cool cucumber and sambal.A favourite Chinese dish is char kuey teow: flat noodles stir-fried with soy sauce, prawns, egg and chilli. This dish is best ordered from one of the many hawker stands as even the best restaurants cannot recreate the taste of a dish that has been cooked outdoors and in a well-used wok. Hainanese chicken rice is also widely available and is well worth a try.Most Indian food in Malaysia is of the South Indian variety and food comes served on a banana leaf. Try fish or chicken curry, dhal, rice and vegetables of your choice. Or if you're making an early start, give roti canai a go, it is a wheat-flour pancake peculiar to the Indian-Muslims of Malaysia and is a huge breakfast favourite. Sites and Sounds:A very visible landmark in KL is one of the world's tallest buildings - the Petronas Twin Towers. The two towers are based on an Islamic geometrical design and are connected by a sky bridge, which is open to visitors during the day. It houses many offices and a very popular shopping centre. You may recognise the towers from their appearance in the film Entrapment which starred Sean Connery and Catherine Zeta Jones.Merdeka Square is the field where Malaysian independence was announced on 31 August, 1957. The tallest flagpole in the world can be found there standing tall. 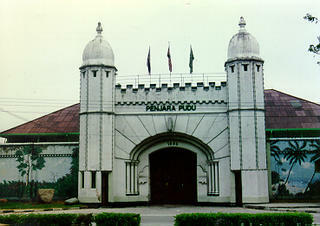 On one side of the field is the Selangor Club: a club with a Tudor design that was built and patronised by the British. It was a whites only club. Cricket was also played in the square on those balmy, imperial afternoons. Pasar malam (meaning 'night markets') are an experience not to be missed in KL. The stalls are mainly on the roadside pavements, but as they spill out into the streets, these roads are considered pedestrian zones for the night. Everything can be found at pasar malam including food, clothes, accessories, CDs, pirated or mock branded clothes and souvenirs. Armed with your bargaining skills you can get many things at competitive prices. A famous pasar malam in KL is the one along Petaling Street. It sits in the heart of the Chinatown of KL. During the day, you'll find old Chinese medicine shops on this street. The Little India of KL can be found in the older section of the city. Masjid India Street is lined with shops offering saris of a multitude of colours, Indian eateries, sweet shops selling delicious snacks and shops offering Indian accessories such as bangles and scarves.And...KL is no longer the capital city of Malaysia, but long into the future will be the bustling business capital and the melting pot of the country. The city has progressed from a muddy mining town to one of the more prestigious cities in South East Asia. -sistuated at the confluence of Klang and Gombak rivers. -on the spot considered a birth place of modern day Kuala Lumpur. -officially open by Sultan of Selangor on 23rd of Dec 1909. -the oldest mosque in KL. 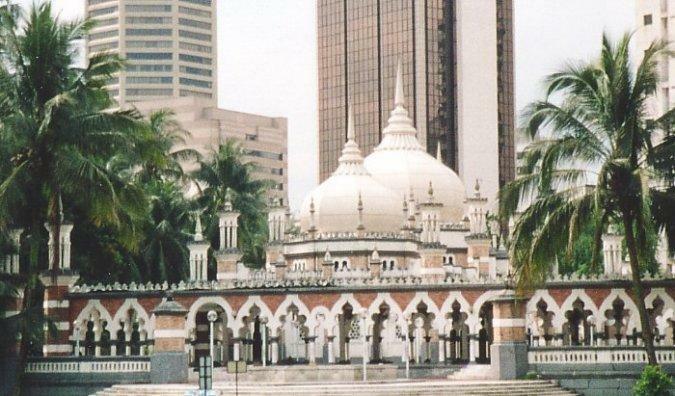 -the main mosque of Kuala Lumpur until the national mosque was built in 1965.
the street and the LRT nearby on Friday. -"Jamek"-derived from Arabic means a place of congregation for religious purposes. -inspired by the Mogul architecture of India. -beautiful example of Neo-Moorish design. -there are three domes surround the prayer hall;the central dome is 21.3m(70ft)high and is flanked by the lower domes. -the biggest domes at the centre was collapsed in the 1990s and later rebuilt. -at the corners are two red and white minarets. -a large number of small chatris top the entrances and corners of the mosque. -using Kl monorail go to Hang Tuah station,transfer to the Star LRT . -a must visit for all who come to Kuala Lumpur. -open daily except during prayers times. -stay duration at the mosque -approx 3\4hour. 1.0 The concept of open air shopping, where a street vendors take over a designated street to set up shops. 13.0 A good starting point is to offer 40-50% of the price quoted, most the time the vendors will flatly refuse, but will likely make a counter offer. If the vendor is keen he will call after you. 14.0 Its is good to check out a few stalls and do some comparison before you start bargaining. Don’t start bargaining on something unless you are going to genuinely interested. 15.0 Remember to keep the smile as you bargain, treat it as game & fun, don’t stress yourself out if you can not secure the best price. 16.0 Be content that any price you pay will probably be less than what you will be paying back home anyway. 17.0 Something’s you cannot bargain on are the ready to eat foods such as noodles, etc. 2.0 Be cautious of your valuables, travel documents, and money went at crowded places. 1.0 Accessibility to Petaling Streets is by taxi, buses, and LTR. 1.0 If you have not been to Petaling Street or the twin towers you have not been to KL. 3.0 A revolving restaurant ‘Seri Angkasa’ at the lower deck offers local and international cuisine however admission is strictly by reservation. 6.0 The restaurants residence pianist render lovely melodies of which you could also make a request for you favourite songs while you wine and dinner. 3.0 An annual event called the Menara Kuala Lumpur run is held during 1st Feb, where the participants run through the staircase to the top of the tower. Mat Kilau, a legendary Malay warriors: famous for fighting the colonials headed by the British Resident, Hugh Clifford. The fight that took place in the late 19th century, came to be known as the 'Pahang War' in the 1890s. Mat Kilau was born in Kampung Masjid Pulau Tawar and grew up during the reign of Sultan Ahmad Al-Muazam Shah in the early 1880s.His father's name is Tok Gajah or well known as Imam Perang Rasu and his mother's name is Mahda who is the daughter of Tok Kaut in Burau. He married a girl named Yang Chik binti Imam Daud from Kampung Kedondong and had three children.When he was in his 20s, the British came and took over the State of Pahang. With their arrival, they sowed discord among the State's chieftain. While some were in favour of their presence, there were others who did not take kindly to the British intervention in Pahang's administrative affairs. Unfortunately, the Sultan himself welcomed their arrival having been taken in in by their convincing promises of wealth and luxury. Those who were opposed to the British were headed by Tok Gajah, Mat Kilau, Dato Bahaman, Mat Kelubi and many others. Because of the Sultan's attitude, they were forced to hide their intention and take action on the quiet. Mat Kilau's revolt was between the year 1891-1895. He rose to fight against British Colonies for several reasons. The Resident of Pahang J.P. Rodger introduced a few new rules and regulations which were against the traditional values of the people. Pahang was divided into 6 districts and under the Magistrate and Collector's administration. The Malay leaders were forbidden from collecting taxes but they were paid pence (according to their standards). Every citizen of Pahang had to pay land tax and they also had to obtain licence in order to search goods in the jungle. The Malay leaders lost their income and also their power on their very own land, Pahang. At the same time, Dato' Bahaman, formally known as Orang Kaya Semantan realized that the British wanted to take control of Pahang. Together with his men, he revolted against the British and its colony. This is when our hero, Mat Kilau came into the picture. History tells us that Mat Kilau and his father, Tok Gajah helped Dato Bahaman. They became Dato Bahaman's main men. When Dato Bahaman revolted against British in 1891 , they lent him a hand. Mat Kilau's skills were proven in the Lubuk Terua war. This incident happened because British caught 3 of Dato Bahaman's men while they were searching for goods in the jungle without licence. Furthermore, British built a police station in Lubuk Terua (Dato Bahaman's territory, near the bank of Semantan River), without his knowledge nor permission. So Dato Bahaman and his men (including Mat Kilau), attacked the police station and they managed to win over Temerloh. Mat Kilau was very eager to win this war because his 3 men were held in the very same police station. So they managed to take Temerloh from E.A Wise, the British officer. In this attack, two Sikh police officers (British) were killed, and one was injured. Through the open revolt, Mat Kilau and Dato Bahaman's followers began to increase, when 600 supporters from Bentong, joined them. They were also helped by 100 natives who acted as spies in the jungle (to look out for enemies). They also had the support of the Malay leaders of Pahang. Soon a group of Malay leaders lent a hand to British in order to catch and imprison Dato Bahaman and his followers. As it's against the Malay tradition to betray the Sultan, it's seen as betrayal. So Dato Bahaman, Mat Kilau, and his follower backed out. They went to the Kelantan and Terengganu and took refuge there for a while. Soon after, Mat Kilau and his followers launched another attack. This was when they obtained support from a Terengganu religious leader Sayyid Abdul Rahman Al- Idrus formly known as Tok Ku Paloh who told them that they were fighting for justice not cruelty. So Mat Kilau, Dato Bahaman and their followers attacked Kuala Tembeling and managed to win over the Jeram Ampai Fort on Jun 1894. However, the success did not last as the British were fast to act and they managed to defeat them. Dato Bahman and all his followers ran away to Kelantan and Terengganu for the second time. Hugh Clifford, the Pahang's British Resident was assigned to catch the Mat Kilau's followers in Kelantan, but he failed as he was supported by the Kelantan government and also the people. Dato Bahaman ran to Siam and died there. As, for Mat Kilau and his father Tok Gajah, they died in Terengganu. The revolt of the people of Pahang (including Dato Bahaman and Mat Kilau), took a long time and lasted for 4 years (1891-1895). Even though British defeated them, but it left a serious impact on British administration in Pahang. Their goods collecting process was interrupted and the administration was not running smoothly. This caused a terrible financial crisis, especially when The Strait Settlement Organization did not approve the loans. This crisis became the major cause of Pahang's participation in the Malay State Federation 1896. His patriotic spirit became the inspiration of the upcoming fighters of right in Pahang. Mat Kilau left a great impact on Pahang and its people, even till now. 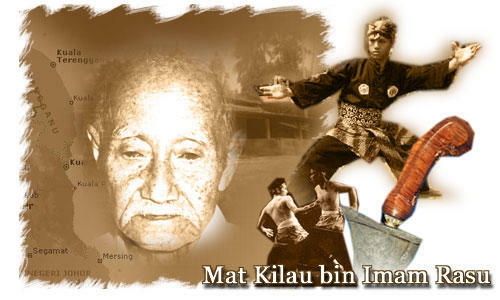 Mat Kilau is well known for his bravery, courage and as Malaya warrior who fought against English colonization. He had contributed a lot to this nation. One of his contributions was during Lubuk Terua war. During the war, he played his role very well and his bravery, strength and courage led to victory. Mat Kilau developed a small settlement by the river in southern in Kelantan. He did that with one purpose to avoid from being arrested by British soldiers and to continue his fight against British colony in Kelantan. One of his contributions which can be seen until this day is a mosque which is situated in Kampung Masjid, Pulau Tawar. The mosque is nearly 200 years. The mosque is the place which fueled patriotisme among the people who stayed in Pahang during British Colonization. The mosque was built by Mat Kilau and and people in Pulau Tawar 1880. In 1923, the mosque was rebuilt. News of Mat Kilau's death was been published in two English newspapers in Singapore. The Straits Time and The Free Press reported that 'The Chief Traitor', Dato' Bahaman had lost the battle in October, 1895.The Free Press reported that Mat Kilau was injured on his face and his head when he resisted. The injury was so bad and he died on the way to downstream of Kota Bharu due to excessive bleeding. In the public's opinion Mat Kilau's life was finished. But nobody knew what really happened except friend Mustafa B. Awang Mat (Jusoh Rimau), Pendekar Tok Delami Ibrahim (Pak Him) and Mat Kelantan. In December 1969, Mat Kilau who was known as Mohamad bin Ibrahim (I/C: 2044778) introduced himself at his hometown. With the help of Omar bin Mat Kilau, Mat Kilau was brought to his hometown, Kampung Masjid Pulau Tawar. On Friday 26 December 1969, Mat Kilau went to the mosque at Kampung Masjid for the Friday prayer. After prayer, he read the Quran and then announced himself as Mat Kilau. His announcement surprised so many people that the Pahang Government had to set tup a committee on the 8th, of Januari 1970 to investigate his claims. Several people were questioned to determine that Mat Siam was actually Mat Kilau. Detailed investigations over several months by the Pahang government upheld the revered warrior's claim. The investigators had based their decision partly on tell-tale marks on his body and his bullet wounds. Asked how he could still be alive well past 100 years, Mat Kilau was reported to have said: "Even prophets and saints die, but if God wills it, then He can surely prolong the life of one of His servants." After intensive investigations, at 10:30 morning on Thursday, 6 August 1970, Mat Siam was declared as Mat Kilau by Chief Minister of Pahang. Four days after the declaration, Mat Kilau passed away at the aged of 122 years. He was buried near his birthplace, not far from the mosque. Mat Kilau Warrior’s Adventure trail is available for those who is visiting Pahang. This trail is the most popular due to the sightings of Fishing Eagles, gibbons, pheasants and Tapir. Kelantan on the eastern coast of Malaysia is the home of Malaysian batik.Originally an Indonesian craft, batik has made itself at home in Malaysia. Malaysian Batik is the best in the world and is created by four methods: block- printing, drawn free style, silk-screened, or tie-dyed. Batik fabrics are usually cotton and silk. 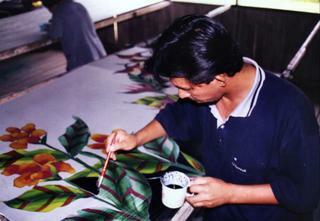 Batik cloth is produced by drawing out a design with wax and dying the material. The wax is then melted away by boiling the cloth, and a second wax design is drawn in. After this repeated process, an intricate and beautifully coloured design is produced. Batik can be found as cloths, cushion covers, table-cloths, placemats or simply as works of art. Batik sarongs are usually a novelty with tourists. Since each piece of batik cloth is crafted by hand, no two pieces are alike. Visitors to these batik production outlets have the advantage of learning the process and also buying batik at factory price. - Facilities such as jogging tracks, exercise stations, children’s playground and rowing boats. 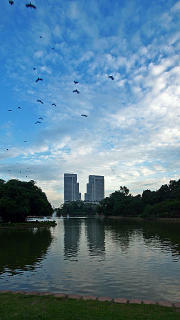 - Some places of interest such as The Orchid Garden, Hibiscus Garden, Butterfly Park, Kuala Lumpur Bird Park, Deer Park. - Officially open by Her Majesty Queen of Malaysia, Tunku Bainon. - The largest covered bird park in the world. - More than 3,000 birds from 200 species of local and worldwide birds. - Experience of watching colorful and melodic birds. - Commuter train: disembarked at old Railway station (KTM) – near the national mosque. Its also world longest mural. 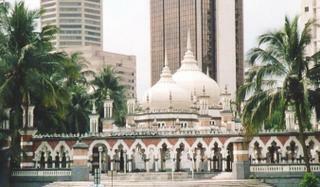 -The National Mosque is located near KL Railway Station along Jalan Sultan Hishamuddin. 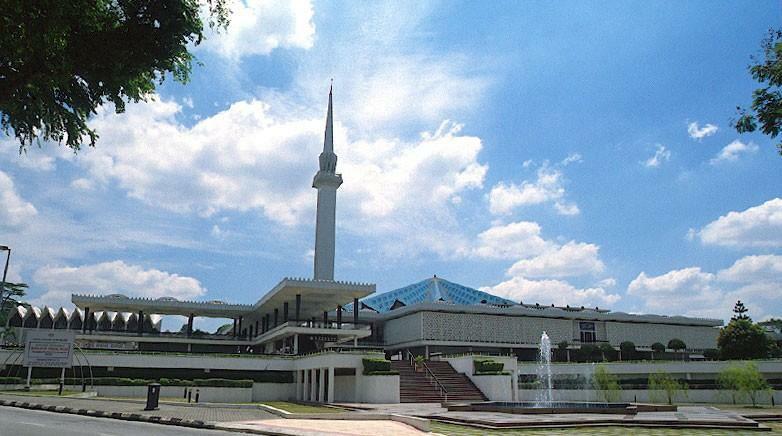 Address : Masjid Negara, Jabatan Kemajuan Islam Malaysia, 50480 Jalan Perdana, Kuala Lumpur. -It is laid out in a garden of about 13.5 acres (5.5 hectares) and cost RM10 million to build. -It took 3 years to complete and was officially opened in 1965. -It is reputed as one of most beautiful mosques in South - East Asia. -Its unique modern design ambodies a contemporary expression of traditional Islamic art,calligraphy & oranamentation. -Major venue for Friday Prayers. -is surrounded by deep verandahs which are screened off by white grilles of traditionalIslamic designs, similar to those in the mosques at Agra and Patephur Sikri in India. -is carpeted and the remaining area is finished in terrazzo. -is sheltered by a folded-plate roof in the shape of a 'semi opened umbrella' with 18 pleatsradiating from the centre instead of the traditional 'onion shaped' dome. -The Grand Hall and the verandahs provide a praying space of 7,432 sq metres which canacommodate 8,000 people. -The building itself occupies an area of almost 5 acres (2090 sq metres) and consists ofthe Grand Prayer Hall providing a floor area of 2,083 sq metres, the dewan, mausoleum,library, offices, open courtyard and minaret. -is located on the south side of the Mosque and is an all-purpose hall which can seat 500persons. -The air-conditioned library and offices are situated on the rear of the main building. -The mausoleum situated, at the rear of the Mosque stands in a circular reflecting pool andis connected to the main building by a covered footbridge. It is circular in plan and is alsocovered by a pleated shell concrete dome similar in shape to shape to that of the GrandHall but having only folds, one of which covers a reserved area for a national hero's tomb. -It is partly covered by 48 independent concrete parasols to provide shade and architecturalcontrast, the fountains for ablution being located on the floor beneath. -is 3.81 metres x 3.81 metres rising from the centre of the long and narrow reflecting poolby the side of the Grand Hall. -The top of the minaret is decorated with a concrete spire which takes the form of a closedumbrella and soars 27 metres above the balcony. -Ladies have a separate staircase directly connected to the ladies' ablution hall and theypray in the gallery at the north end of the building. -This Gallery also provides booths for television and radio services and a place from which visitors witness the proceedings . Monday - Thursday : 10.00 am - 12.00 am, 2.00 pm - 4.00 pm. Friday : Only for Praying. Saturday, Sunday & Public Holidays : 0.00 am - 12.00 am, 2.00 pm - 6.30 pm. SMART is an acronym for Stormwater Management and Road Tunnel, a project under the Federal Government initiated to alleviate the flooding problem in the city centre of Kuala Lumpur. The project is implemented through a joint venture pact between MMC Berhad and Gamuda Berhad with the Department of Irrigation And Drainage Malaysia and the Malaysian Highway Authority as the executing government agencies. Studies had indicated that the critical stretch of Sungai Klang between Sg Klang /Sg Ampang confluence and Sg Gombak/ Sg Klang confluence to be flood prone areas and the fact that the river is further constrained by the Jalan Tun Perak Bridge (near Masjid Jamek) which is low, has resulted in the surrounding areas to experience flash floods.The SMART system will be able to divert large volumes of flood water from entering this critical stretch via a holding pond, bypass tunnel and storage reservoir. 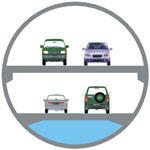 This will reduce the flood water level at the Jalan Tun Perak Bridge, preventing spillover. The Stormwater Management and Road Tunnel (SMART) project was incepted by the project proponent, namely MMC Berhad-Gamuda Berhad Joint Venture, primarily to mitigate the recurring floods in the city of Kuala Lumpur, the financial, business and commercial hub of Malaysia. However, at the design stage of SMART, the dual purpose concept was born from the ingenuity of the project proponents and the motorway tunnel was integrated into the system to relieve traffic congestion at the main Southern Gateway to the city centre. Next in our itinerary is the Parliament House; we will not be able to disembark because it is a restricted area. However you will be able to have a bird eye view from the comfort of your seats. 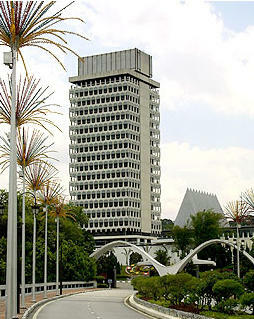 Parliament house is located in Jalan Parliament in Kuala Lumpur, neighboring lake gardens and the national monument. In September 1962, a hill 61 meters from sea level was flattered to build the RM 18 million complex, an idea of which was mooted out by our first prime minister, Tunku Abdul Rahman Putra. The parliament complex was completed in 16 months and officially opened on 21 Nov 1963, by his highness Tuanku Syed Putra, the 3rd king of Malaysia. The complex consists of two parts, the main building and a tower. The main building which is 3 storeys high is where the Dewan Negara and Dewan Rakyat is located. This is where members of Parliament conduct debates and laws are passed. This building also consists of a canteen, prayer room, journalist room and a banquet hall. It also features a recreation area ‘known as Taman Sare’ at the 2nd floor for members of parliament to rest in between the proceedings. For your information, Malaysia practices Parliamentary Democracy with constitution monarchy and his highness the King is the paramount ruler. The Tower which is 17 storeys high, houses the offices of the minister and member of parliament, which are well equipped with the latest state of art communication system to follow the proceeding in progress. The 2nd floor of the tower is a specially designed sitting area facing a field on which march past is conducted during official parliament ceremonial event, like honouring visiting head of states, etc. The uniqueness of the parliament building is installed with carved ornamental patterns with is made by local concrete, which controls the sunlight entering the building thus making it much cooler. This beehive shape ornamental also add splendour to the building’s appearance. Apart from these special features, various plants and animals also beautify the complex. Next to the Parliament complex is an open area in which lies the Deer Park, that houses Tootal deer’s. This species of deer is indeed rare in Asia was presented by his excellence the President of Indonesia Mr. Suharto as a gift to Malaysia. The deer’s are free to wonder which ads ambience the parliament complex. 1. Opening statement should never start with negative words, such as unfortunately. 2. Our first Prime Minister is address as Tunku and not Tuanku. 3. Added information was given, stating that the deer’s at Parliament house was a gift from the President of Indonesia, Mr. Suharto. 4. Information on accessibility is not necessary since it is a restricted area. · The National Museum was originally as the site for the old Selangor Museum which was opened in 1888. It was accidentally destroyed by the Allied Forces during the World War 2 in 1952.Later, the government appointed an architect to design an exclusive structure which was declared open in year 1963 as National Museum by the British Resident, Sir Gerald Templer. · It was built in the style of traditional palace of Malay Kings. Consists of large central main entrance hall that is flanked by two exhibitions wings.The two large murals on the exterior of the exhibition wings depicts scenes of the country -the mural on the right depicts the culture & customs of Malaysia while the one on the left chronicles the historical episodes of the nations. The museum was later extended in the 1990s to include a library, auditorium & exhibition hall for thematic exhibitions. Collection vary from ethnographical objects, archeological artifacts & natural history specimens. It is currently under the administration of the Department of Museums & Antiquities. · Visiting hours are from 9am to 6pm daily except close on Hari Raya Aidilfitri & Hari Raya Haji. Admission Fee is RM 2 for adults & free for children under 12 or children wearing school uniform. II. Cultural – Discover the difference & the similarity of the Malaysian in costumes, ritual Ceremonies, religions etc. III. Ceramic – Discover the vast collection & remarkable delicate artistry techniques of the ceramics & pottery adhering to traditional art. IV. Weaponary – Exhibits all types of weapons which were invented from early Bronze Age to today’s modern weapons. V. Music – Discover how music was created within the ethnic groups of the Penisular, Sabah & Sarawak & external influences. Enjoy the scene from the presentation of the traditional dances illustrated in the gallery. VI. Faces of Malaysia – Discover the likeness & disparity of human characters through the faces of ethnic communities that reside in Malaysia. I. Vehicles – Display of old vehicles used by the local rights to the first Prime Minister of Malaysia etc. II. Building Structure – Collections of archway of different kinds, Melaka Steps & even memorial poles. III. Monument – all sorts from the King Henry VI to Sir Frank A Swettenham. Exhibitions are held at interval to promote an awareness of the country’s rich cultural & historical heritage i.e. Malaysia Maritime, Archeology, Enduring Beauty & World of Ghost etc. · Museum Gift Shop – Located at the ground floor with collection of gifts with artistic & historical significance. · Walking distance from KL Railway Station. Bus is available from the city to National Museum or by taxi transfer from the nearest Putra LRT station at KL Sentral. The Thean Hou Temple is a striking six-tiered Chinese temple. It is located on 1.67 acres of land atop Robson Hill overlooking Jln.Syed Putra (Federal Highway). - Built by the Hainanese community living in Kuala Lumpur & is dedicated to Goddess Tian Hou (The Heavenly Mother). The Hainanese (people originating from the island of Hainan in China) were traditionally fishermen and sailors. They prayed to and worshipped Tian Hou for safety and protection while they were at sea. This practise has continued even though their community in KL no longer goes out to sea. The people coming to this temple for worship are from a cross section of the local Chinese population (of all walks of life and various dialects). - Managed by the Selangor and KL Hainan Association. -The ground breaking is done in 1981, completed in 1987 and officially opened in 1989. - The temple is open daily from 8am to 9pm.It is one of the largest Chinese temples in South-East Asia. - Designs: This syncretic temple with elements of Buddhism, Taoism and Confucianism is a grandiose structure and represents a successful combination of modern architectural techniques and authentic traditional design. The decorative beams, spectacular roofs, domed ceiling, calligraphic couplets, murals and elaborate embellishments (decoration) reflect the features of Chinese architectural beauty in Malaysia. - The front entrance of the temple features a multi-arched gateway with red pillars, the colour symbolic of prosperity and good fortune. -In the small garden at the front of the temple are interesting statues of Guan Yin and the Three Wise Men (from right; The God of Longevity, he holds a staff and a peach with long beard; The God of Wealth, he holds a sceptre sword; and, The God of Happiness and Prosperity, he holds a child). -Sculpture of the 12 animals representing the years in the Chinese calendar can also be seen. 2) 2nd.level - is the multi-purpose hall where cultural and religious activities are held. 3) 3rd.level - the marriage registration office and resource centre. 4) 4th.level(3 tiers) - houses the main temple shrine. -The prayer hall houses 3 altars, each with a sculpture of one deity or goddess. As we enter the prayer hall, the altar on the right is dedicated to Guan Yin, the Goddess of Mercy. Thean Hou is in the centre while Shui Wei Goddess (the Goddess of the Waterfront) is at the left. 1) Perfect place to relax and enjoy the panoramic view of the temple set against the Kuala Lumpur skyline. 2) Located to the right of the prayer hall, behind a souvenir stall is a small fountain and wishing well with a statue of Guan Yin. It dispenses drinkable water when a visitor kneels or steps on the platform. 3)Cultural activities: Apart from being a place of worship, the temple is also a place for cultural activities like the grand birthday celebrations for Thean Hou Goddess, Kuan Yin and the Goddess of the Waterfront, Dharma Prayers, Wesak Day, Mooncake Festival and the 15-day Chinese New Year celebration. 4) Fortune Telling: At the prayer hall, there are 3 'fortune telling' machines. Each machine consists of a cylindrical container with small drawers around it. Numbered sticks have been placed in the container. You will need to draw up the whole bundle of sticks and drop them back into the container. The sole stick that sticks out is your 'luck'. You then match the number on the stick with the appropriate drawer. Each drawer contains pink slips of paper with the fortune told in Chinese and English. 5) Couples like to come to the temple to take their wedding photographs. The temple is also renowned for its marriage registration services offered. 6) Evening time, Qigong, tai-chi and wushu classes are sometimes conducted. Lin Mo was born on the 23rd day of the 3rd month of the lunar calendar in 960AD (Song Dynasty). The baby was given the name Mo (silence) because as a newborn she never cried. She grew up in Meizhou Islands off Putian in Fujian and died on the 9th day of the 9th lunar month in 987AD at the age of 27.Lin Mo was always lending a helping hand to villagers who were in difficulties, and she gained love and respect for her many good deeds. Her knowledge of herbal medicine enabled her to cure the sick and she taught the villagers how to prevent diseases and ward off calamities. She was also familiar with the sea and was good at making astronomical observations and calculating weather changes. Lin Mo could tell when the right time was for sailors and fishermen to go to sea. As a deity, her reputation spread and grew. It was said that she could ride the clouds across the ocean, and many times used her powers to save merchant ships and fishing boats. She was honoured several titles by different emperors of different dynasties - Song, Yuan, Ming and Qing. During the Qing Dynasty, she was known as Tian Fei(Heavenly Princess), Tian Hou (Heavenly Empress)and Tian Shang Sheng Mu (Divine Mother of Heaven). She is also known as Ma Zu (or Ma Zhou and Matsu), Tian Hou Niang Niang and also, Ma Hou.